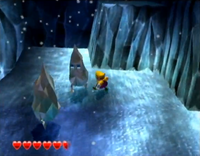 Icicle Mites are large icicle-like enemies that appear in the game Wario World. They are found in the cave portions of Shivering Mountains. They resemble large, walking icicles with eyes, and can only hurt Wario if he jumps on their single sharp point. They are weak to Wario's punches and can be used as stepping stones. If Wario stuns one and performs a Piledriver on it, the Icicle Mite embeds itself into the ground, where it remains as a step for Wario to climb up to higher ground. However, the effect is temporary, as the Icicle Mite will explode after fifteen seconds of being stuck in the ground. This page was last edited on January 27, 2019, at 20:55.